The Mackerel Are Coming! The Mackerel Are Coming! When the spring mackerel run begins, look for crowds of boats and birds! Word is that the pods of bait fish that both Spanish and king mackerel love and follow are now north of Tampa Bay and heading towards our Big Bend/Natural North Florida waters. That means, that by the middle of March, the “bite” should be hot and heavy at places like Seahorse Reef at Cedar Key and Red Bank Reef at Suwannee. And then, by the first of April, look for mackerel marauding the flats and shallow reefs off Taylor, Jefferson and Wakulla counties. Big Spanish mackerel, like this one, are fun to catch on light tackle. But get out the big “guns” for big kings, also called “smokers”. There are two ways you’ll know if the mackerel are nearby. One, they’ll attack whatever bait you’re tossing for seatrout, redfish or grouper and cut you off, taking the business end of your tackle. And second, you’ll see birds, usually gulls and terns, wheeling over a splashing feeding frenzy on the water. In either case, it’s time to get your tackle ready. And, in many cases with springtime anglers, it’s not a bad idea to keep a mackerel outfit rigged and ready–just in case! Spanish mackerel are fun to catch on light, 4000-class, spinning gear, but the bigger (and faster) king mackerel will “smoke” a light reel’s drag. So, gear up with stronger rods and reels. I prefer a Shimano TLD25 reel, spooled with about 400-yards of 20-pound monofilament (it’s stretchy!) on an 8-foot rod. I can cast this outfit, or use it to troll. I can even use it to set out a live bait for kings while I’m bottom fishing over rock piles and reefs. Why 400 yards of line? Kings are super-fast and they’ll sometimes take half a spool of line before you can set the hook. In both cases, for kings or Spanish mackerel, be sure to use a short trace of wire leader–that’s the one thing their teeth won’t cut! Trolling over reefs or around the outside of a school of hungry mackerel is probably the best way to produce a bite. 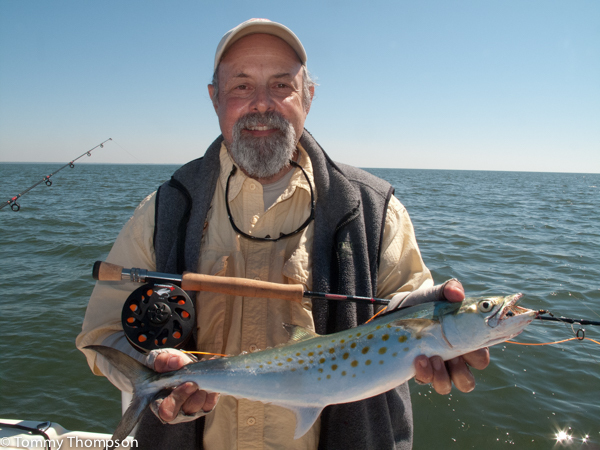 For Spanish mackerel, use either a #00 Clarkspoon or a 1/2 ounce Flowering Floreo. I “tip” the Floreo with a short strip of FishBites or mullet belly (Salted and frozen is best–a good at-home project before the trip!). Kings will eat bigger baits, and many successful anglers troll big Drone Spoons or Mann’s Stretch 25+ Crankbaits. For both members of this pelagic family, the best trolling speed for boats is 4 to 5 knots.A king will also eat a live bait, especially a blue runner, freelined behind the boat while drifting or anchored fishing for bottom fish. Be sure to use the red bead on your Clarkspoon is intact!